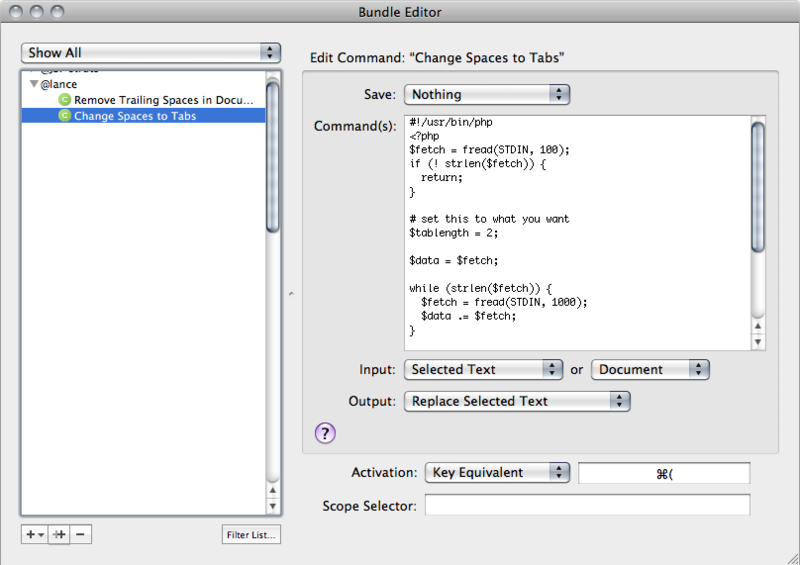 Select your bundle and use the “New” menu at the bottom left of the bundle editor to add a new command. Name it “Remove Trailing Spaces in Document / Selection” and paste the following code into the “Command(s)” field. If you want to map the command to a keyboard shortcut, find the “Activation” menu, click the input area, and enter the keyboard shortcut. I use Cmd-Shift-0 for this command. Leave the other settings as they are, and save the command. I use Cmd-Shift-9 as the keyboard shortcut for this command. 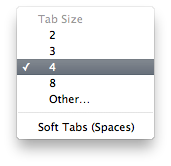 Next, check your settings for Tab Size at the bottom of your TextMate document window. I use “Tabs: 4” with “Soft Tabs” unchecked. Now, let’s use the newly added commands. Remove extra line endings and check for extra spaces or newlines after PHP blocks. 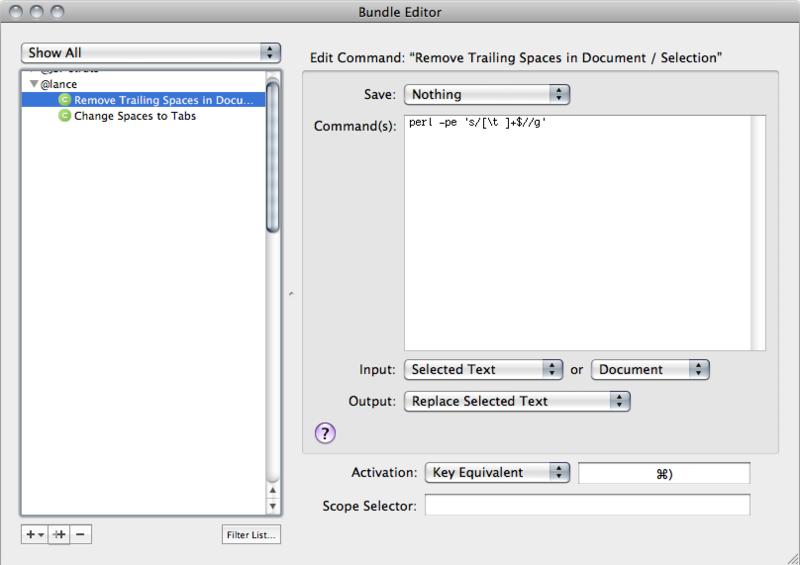 Run the “Remove Trailing Spaces in Document / Selection” command on each file. If you don’t have any text selected, the entire file will be changed. Convert spaces to tabs at beginning of lines. Run the “Change Spaces to Tabs” on each file. Follow WordPress conventions for spacing around braces, function calls, and variables. See WordPress Coding Standards under “Space Usage” for details. Note: This won’t catch all the cases. The remaining PHP code will need to be cleaned up by hand if you want to be thorough about spacing. Use TextMate project search/replace to find ) ?> and change to ); ?> and to find )?> and change to ); ?>. Use single quotes in PHP. You should always use single quotes in PHP unless you have to include variables, or wrap strings with single quotes in them. Find "" and change to ''. For example, <?php single_cat_title( "", false ) ?> needs to be changed to <?php single_cat_title( '', false ); ?>. The most common mistake is to use a lowercase “p”. Use TextMate project search/replace for Wordpress and change to WordPress. Why do all this cleanup? If you work alone, these changes might seem petty or nit-picky to you. As soon as you collaborate with another developer, however, having consistent coding standards makes sharing code much easier. Looking at a diff of each others’ code will be more useful if the differences match only the changes that really matter. If each change has whitespace, indentation, and coding style differences, it will be much harder to find the changes you care about. On a higher level, code you contribute to core WordPress or the community as a whole in the form of a plugin or theme should conform as much as possible to WordPress Coding Standards. Using these few TextMate commands to quickly clean up your code will go a long way towards meeting those standards. Haha—that’s a good problem to have, Brandon. Let me think… oh, you could speak at more WordCamps and spread goodwill to people everywhere with your theme-fu. Holy cow, having a “remove trailing spaces” command is a beautiful thing. Thanks Lance! Hey Gordon, glad you found it useful. We actually just switched to soft-tabs set at two spaces. It helps preserve formatting regardless of the editor you use. That said, consistency is key to having maintainable code.